Patrick Drake originally began a career in Law. In 2012 his passion for food set him on track to co-founding the world’s most successful meal kit delivery service: HelloFresh. The aim of HelloFresh is to make cooking an easy, stress-free and enjoyable experience for people from all walks of life. In order to promote this, HelloFresh challenges the relevance of supermarket shopping by delivering fresh produce to houses in perfect quantities. Conveniently this service aims to not only minimise waste, but the workload for the cook, therefore maximising time to excel in the kitchen. As well as quantifying fresh produce, HelloFresh spices are portioned perfectly in small pots. HelloFresh spices are of the highest quality and sourced worldwide in order to capture authentic flavours of the region. Owing to their high quality, HelloFresh spices are used in small quantities to reflect the abundance of flavour packed into as little as a teaspoon. Whether you are looking to cook a fragrant chicken curry or a flavoursome smoked salmon spaghetti, HelloFresh are on hand to fill your dishes with flavour. Offering an extra addition to the HelloFresh delivery Service in 2018, Patrick Drake wrote a cookbook ‘Recipes that Work.’ The book truly captures the essence of HelloFresh philosophy; cooking easy and quick meals from scratch is easily achievable for everyone – from the novice cook to the experienced chef. Filled with tips and tricks, including how to attempt intimidating tasks such as butterflying a chicken, Drake assures us that no aspiring cook will struggle to muster up his recipes. Once more, the cookbook offers meals to suit everyone: If you’re running short on time, cooking up a fiery King Prawn Linguine with a rich sun-dried tomato sauce in 20 minutes (page 130) certainly seems tempting. If you have more time on your hands at the weekend, maybe you’ll be enticed by a delectable slow cooked Bedouin Chicken Tagine (page 216) to enjoy with a bottle of wine. Without HelloFresh spices arriving to your doorstep as part of the delivery service, the reader can find and choose their own produce and spices when using the cookbook. By using HelloFresh recommended spices, delicious meals can be made quickly and easily yet still boast rich, authentic flavours. 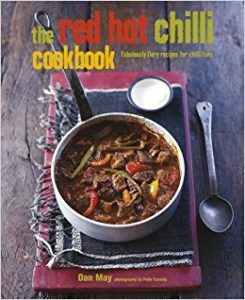 Why not follow their advice and use the Seasoned Pioneers Jalfrezi Spice Mix to make a mouth-wateringly tender Chicken Tandoori (page 96)? Or how about using the Seasoned Pioneers Sri Lankan Curry Powder to create an aromatic Coastal Fish Curry as recommended on page 22? If instead you prefer to find your recipes online, the HelloFresh blog ‘Fresh Times’ is a great place to find new and exciting meals to produce. For instance, we would recommend making Zanzibar Chicken curry using our Zanzibar Curry Powder as HelloFresh suggests (https://blog.hellofresh.co.uk/chicken-curry-recipes/). If you fancy trying something different, maybe Coconut Caribbean Soup will appeal to your taste buds using our Poudre de Columbo (https://www.hellofresh.nl/recipes/coconut-caribbean-soup-with-home-587634244348d20ff616db11?locale=en-GB). Refreshingly, a company that was built off the backs of 2 keen young men in in London, strips cooking back to the basics. By using sourcing fresh produce combined with outstanding HelloFresh spices, you are guaranteed to create truly remarkable meals. If using recipes from Patrick Drake’s cookbook ‘Recipes that Work’ or the HelloFresh online blog, we are here at Seasoned Pioneers to fulfil your spice needs. As recommended by HelloFresh themselves, by using our premium spices you are guaranteed to create meals to be proud of. Techniques. Masterclasses. Ingredients. 300 recipes. These are the claims on the cover of this newly released treasury of Indian cuisine and take our word for it, it delivers on all those claims and more! Monisha Bharadwaj is a qualified chef, food historian and an award-winning author who grew up and trained as a chef in Mumbai and also obtained a degree in Indian history. ‘Cooking With Monisha’ is her highly acclaimed and successful London based Cookery School and she has recreated her cookery masterclass in this book. The cuisine of India is vast and varied, the diversity as a result of different regional cuisines and ingredients. 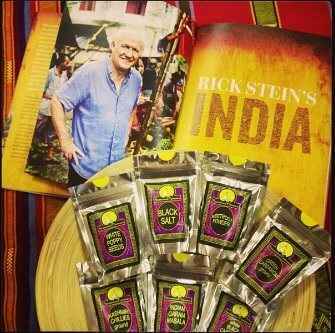 Within ‘The Indian Cookery Course’ you will find fabulous recipes from every corner of India. Additionally there are fascinating chapters about the science of Ayurveda in Indian cuisine, culinary terms and techniques, meal planning, equipment, spices and history. Beautifully worded and illustrated with sensational photographs, this book is not just an inspirational and easy-to-follow cookery book, it is an utter joy to read! We are exceptionally grateful to Monisha for acknowledging Seasoned Pioneers as a recommended spice and ingredient supplier within her book. 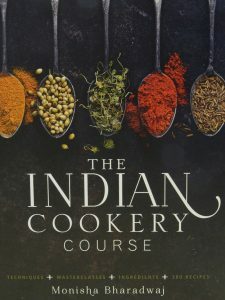 Impossible to put down, this delightful book showcasing 75 signature Indian dishes by Manju Malhi is a treat for anyone who already loves to prepare classic Indian food using Indian spices or is just venturing into this inspiring and rewarding cuisine. Recognised as an accomplished & innovative cook, British born food writer Manju Malhi learned her cookery skills from her Asian mother. Despite her London upbringing, Manju & her family enjoyed a lifestyle rich with Indian spices, culture and tradition. Some years spent living in India enhanced Manju’s passion for Indian cuisine, Indian ingredients, Indian spices and her career has since flourished. Numerous television appearances, national cookery workshops and several books have propelled Manju to be one of this country’s most respected cooks of regional Indian food. Her unique fusion of British & Indian cuisine culminated in the publication of her award winning book ‘Brit Spice’. Other books have followed, each equally inspiring, so we’re delighted to share this latest one with you! In Classic Indian Recipes, each recipe has a short and informative introductory paragraph that contributes to an already overwhelming desire to sample the dish. Simple, clear and concise instructions, easily sourced Indian ingredients and mouth-watering photographs will entice you to strive to emanate the hospitality for which India is so renowned! Whether cooking for family or friends, preparing meals, snacks or treats, this book has something for everyone….with the added bonus of the heavenly aroma that will pervade your kitchen once you start cooking…. …….and did we mention the Apricot Nut Dessert and Nan Khatai……!